A diver's delight, the massive General Hoyt S. Vandenberg is the newest compelling addition to the Florida Keys Shipwreck Heritage Trail. At the trail's southernmost point nearly seven miles south of Key West, the massive ship offers a bounty of captivating dive spots for novices and advanced divers alike. The decommissioned ship, once a venerable part of the U.S. Navy and U.S. Air Force, was intentionally sunk in 2009 to create the Florida Keys' largest artificial reef. Resting upright on the sand, the ship almost immediately began attracting sea life. At 524 feet long, the Vandenberg is almost two football fields long and stands 10 stories tall. The ship's structure begins at depths of about 40 feet and continues to a depth of 145 feet, offering so many great nooks, masts and radar dishes to explore that it cannot all be seen in a single dive. It is the world's second largest ship to ever be sunk to form a coral reef. Ever mindful of creating a fantastic dive reef, planners purposefully moved some ship structures to form more interesting dive spots, even at the upper levels. As a result, the Vandenberg is great for beginning dive classes and novice divers. Its upper structures feature an expansive crows nest, an engrossing bridge, radar dish antennas and the ship's communications center. The foremast and kingpost each present fun spots for photos. With abundant elevator shafts, cargo holds and hallways, the Vandenberg is a joy for light-wreck penetration divers. The holes that were cut into the ship's hull to facilitate sinking now offer handy swim-through spots for advanced divers at more than 100 feet. At 140 feet, divers can explore the ship's 25-foot tall rudder and prop. During ascension, deep divers can stop at the upper foremast and kingpost decompression spots and rest platforms. With its previous role eavesdropping on Russian missile launches during the Cold War and tracking space launches for Apollo, Gemini and Mercury, the ship's specialized equipment creates fantastic dive areas. Immense radar dishes, appealing telescopes and parabolic tracking dishes are just a few of the spots luring divers to their depths. Eventually, the ship will be rife with sponges, various coral species and sea fans, but it is already home to dozens of fish species, algae and other sea life. Originally commissioned for a role in World War II as the General Harry Taylor, the ship transported U.S. troops from Marseilles to the U.S. and later, Hungarian refugees to Australia following the failed Hungarian Revolution. 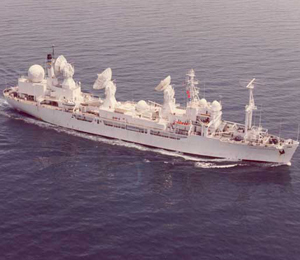 The ship was recommissioned in the early 1960s as the General Hoyt S. Vandenberg and was an advanced range instrumentation ship tracking Soviet Union missile launches and our own space launches. In 1996, it was used in the filming of the movie Virus, starring Donald Sutherland and Jamie Lee Curtis.